A 14-year-old male presented with symptoms of gradually progressive dyspnea on exertion and was observed to have mild cyanosis (patient's saturation on room air: 89%). A frontal chest radiograph revealed mild cardiomegaly with a large anterior mediastinal mass silhouetting the left upper paracardiac border [[Figure 1], panel a]. A subsequent transthoracic echocardiogram demonstrated supracardiac total anomalous pulmonary venous connection (TAPVC) with aneurysmal dilatation of the vertical vein along with a large ostium secundum atrial septal defect (ASD) and dilated right-sided cardiac chambers. The pulmonary artery systolic pressure, by tricuspid regurgitation, was 66 mmHg. The mean gradient across the vertical vein was 14 mmHg. The patient was further advised a computed tomography angiography (CTA) for accurate assessment of the cardiovascular anatomy and for planning surgical management. CTA showed all the four pulmonary veins draining into a common channel which was seen opening into an aneurysmally dilated segment of the vertical vein (indicated by *). This, in turn, drained into the left brachiocephalic vein and then into the superior vena cava [[Figure 1], panels b, e and f]. A thin membranous web was seen within the vertical vein, just proximal to the aneurysm, causing mild stenosis of the lumen at the same level [indicated by block arrows in [[Figure 1], panels c and d]. A large ostium secundum ASD was also seen along with dilated right atrium and right ventricle. Aneurysmal dilatation of the vertical vein in a case of supracardiac TAPVC is an extremely rare condition. 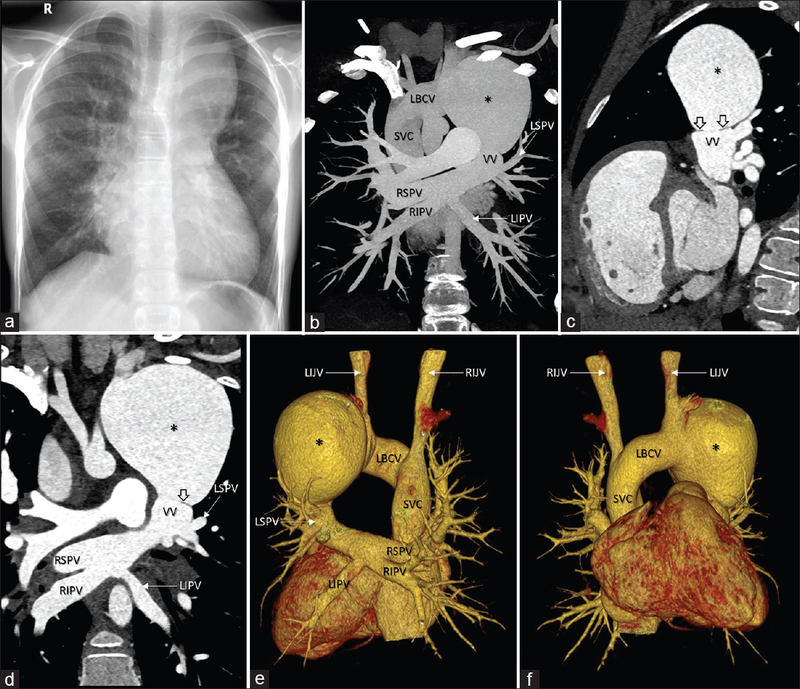 A previously reported case of vertical vein aneurysm attributed the formation of this aneurysm to poststenotic dilatation secondary to severe compression of the vertical vein when it traversed between the left bronchus and the left pulmonary artery. This so-called “vascular vice” was not noted in our case. However, a thin membranous web was seen within the vertical vein, just proximal to the aneurysm, and causing luminal stenosis. A probable mechanism leading to the formation of aneurysm in our case could be an excessive poststenotic dilatation distal to the luminal stenosis caused by the membranous web in the vertical vein. To the best of our knowledge, this is the first ever reported case with vertical vein aneurysm in a case of supracardiac TAPVC associated with a membranous web in the vertical vein. Phadke MS, Mate SD, Kerkar PG. Giant aneurysm of the vertical vein in a case of supracardiac total anomalous pulmonary venous connection. Cardiol Young 2016;26:968-70.